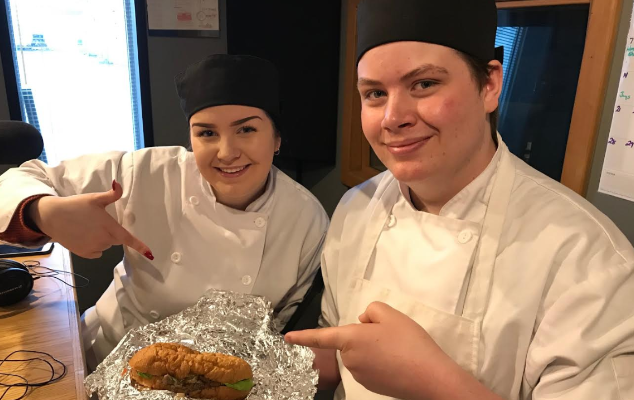 Lambton culinary students Clarisse Gibbons and Jacob Douglas visit Blackburn Radio to show off their award winning sandwich. April 15, 2019. 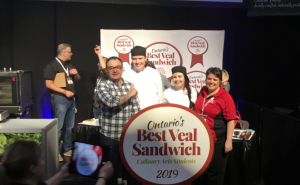 Culinary students at Lambton College brought samples of Ontario’s best veal sandwich to Blackburn Radio’s studios Monday morning. Clarisse Gibbons and Jacob Douglas claimed the top prize in a provincial competition in February, along with $500 each. Lambton culinary coordinator Alastair Mackay said it’s a tremendous honour for the students and the college. Mackay said the award helps to validate what they do at Lambton College. He said even though they’re a small college, they can still do some really good things. Gibbons and Douglas competed against three other teams of two from Toronto-based schools.